There were so many babies this year, turning many only siblings into Eldest siblings! 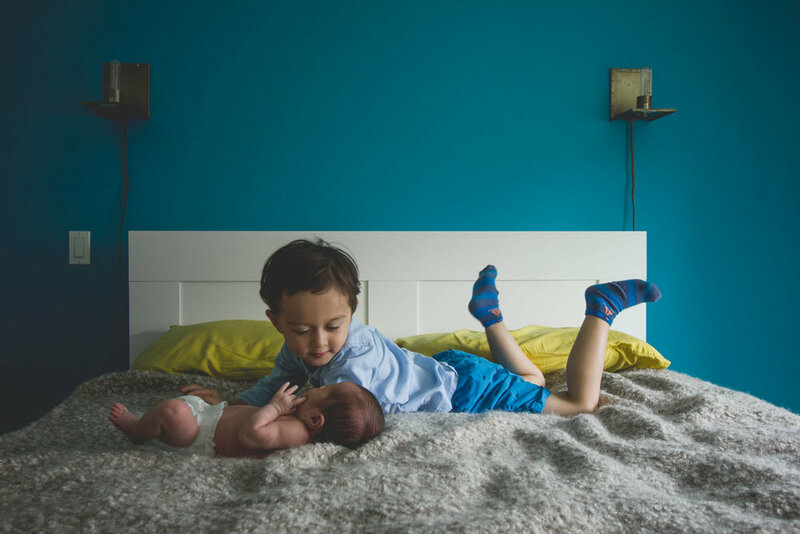 Bram became a big brother to Baby Leni at the start of summer and seems more than happy in his new role. It's pretty crazy and surreal to see so many friends in the place that I was in 6-7 years ago, juggling two little lives so close together. It seemed to drag on forever, but now that it's passed, it feels like it went too fast and I barely remember any of it at all. Although I sometimes feel jealous or bitter that I was the first to have babies, it has been a gift in so many ways. Through blogging and sharing my experiences, it was (slightly) less of a shock of things to come for my friends once they came tumbling down the rabbit hole. It has also allowed me to better cherish these special times and as a result, be able to capture these special moments with greater heart. Being ahead of the curve, I know the important things that will be missed or forgotten. I know the thoughts, feelings, the tiredness and all the internal mish-mash of these early days. These exhausting times are precious. Slow down an enjoy it because when it's over, man is it over! I MISS IT!!! !